“Listening to Antoine & Owena immediately takes me away to an English festival on a hot Summer’s day with all of the sights, sounds and tastes which you can imagine go with it. Foot tapping, cider, wine, singing and dancing. The complementary tones of the guitar and violin work really well as do their voices. Antoine’s lead vocal has the confident air of the folk storyteller, delivered with style and passion. A musical friend of mine commented on the excellence of Owena’s violin playing, saying “the intonation is spot on”… Myself, I just like the sound of it! Individually, Antoine Architeuthis and Owena Archer had been ploughing their separate musical furrows for many years until joining forces in early 2017. Antoine had performed in several bands of varying styles, including rock and progressive music before settling himself in the world of folk and traditional music. Owena’s trajectory was more straightforward having been around the folk scene for over twenty years composing her own tunes, playing fiddle parts in various bands and sharing the stage with luminaries such as the Oysterband, Show of Hands, Megson and Cara Dillon to name but a few. After meeting, Antoine and Owena quickly began writing and performing together and impressively won the Purbeck Folk Festival Rising Award in 2017. Winning this prestigious event understandably provided something of a launch pad for them and they have appeared at a host of festivals and folk clubs so far in 2018. In July the duo released their debut album ‘Hands, Hearts & Hangings’, which is a mix of self written material and traditional songs, all recorded at the legendary Real World Studios. Antoine sings, plays bouzouki, guitar and tambourine whilst Owena contributes voice and violin with special guest musician Anf Abbott filling things out on bodhran. Owena’s mournful violin introduces the opening and self written track ‘The Peddler and the Witch’ before Antoine’s deceptively gentle picked guitar and vocal lead us through a tale that includes the archetypal folk fayre of witches, curses and hangings. Antoine’s voice is clear and tuneful, reminded me a little of Reg Meuross but with a bit more rasp! ‘The Ballad of John Olden’ is a more uptempo number as guitar and violin push things through with some lovely harmonies from Owena on the chorus, while the Traditional ‘My Son John/Lads of Laois’ is a percussive treat and fairly rattles along. ‘The Palmer’s Kiss’ similarly bounces through on a strong acoustic guitar part with some fine violin underpinning but the star of the show is the sweet, almost nursery rhyme harmony vocal chorus that’s just ripe for a bit of ‘folk club’ participation. The traditional ‘The King of the Fairies’ is an all too short instrumental work out for the violin, guitar and bodhran, but this leads in nicely to ‘Summer Longing’ which is my favourite song on the album with it’s fingerpicked guitar and extended harmonies and then next up the ubiquitous ‘John Barleycorn’ is given a good ride for its money with some particularly rhythmic, sawing violin setting the pace. Another traditional track ‘The Rambling Soldier’ gets quite a sparse retelling with Antoine’s voice particularly to the fore and then it’s back to more driving guitar and bodhran for ‘Seventeen’ and the only slightly slower, moodily atmospheric ‘So Alive’. ‘Luna’ rounds of the album in measured, introspective fashion with its courtly guitar strum and staccato notes as Antoine really stretches his voice out, holding the notes over Owena’s soaring violin. A lovely end to the record. Well, this certainly doesn’t sound like a debut record and given the duo’s vast experience, I guess it was unlikely to! The playing is strong and assured, the original songs written with a sense of story and imagery that is stylistically sympathetic to the traditional numbers, all of which is captured in pristine fashion by the recording and production values. 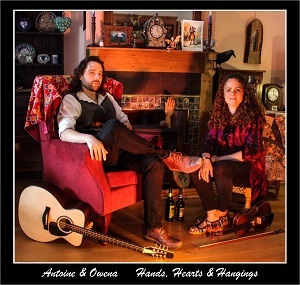 ‘Hand, Hearts & Hangings’ is a fine offering and it’s clear to see why Antoine & Owena are making such an impression in the world of folk.